We've compiled a list of the speediest half marathons across the UK to give you the best chance of setting a new personal best. Nothing is quite as smile inducing as looking down at your watch on the finish line to see a new PB. This selection of super fast and flat half marathons will give you perfect opportunity to run faster than you ever have before. This is just a small selection of the best flat half marathons. If none suit, you can search the complete list of hundreds of races all over the UK. The Hampton Court Half Marathon is run over a fast, flat and interesting course that borders the riverside grounds of the magnificent Hampton Court Palace. 2018 will be the 5TH staging of this popular pre-Spring half. Runners will enjoy the closed road loop around the picturesque village of Thames Ditton, the historic Royal Borough of Kingston upon Thames marketplace, the iconic 3 mile stretch of the Barge Walk beside the Thames, and of course full views of Hampton Court Palace. Once again for 2018 you will be setting off in the stunning parkland of Green Park, on to the highlights of the town centre of Reading where you will experience huge crowd support, and through the beautiful grounds of the University campus. 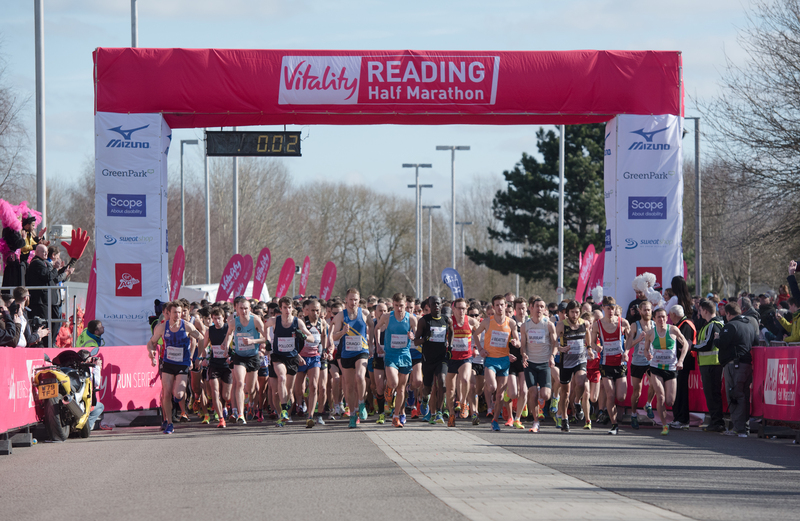 The final straight takes you into the magnificent Madejski Stadium where you'll experience a finish like no other! This really is a race for the experienced athlete looking for a new PB through to the complete beginner looking for a friendly, safe and fun environment to run in. 2018 will be a very special year for the Liverpool Half Marathon as it will its 25th staging. The event generates a brilliant atmosphere, with the widest possible range of runners taking part, as first timers and old timers mingle together on the famous waterfront. The course takes runners out of the City and up the only real hill in the race to Sefton Park. The last four miles are perfectly flat, along the famous River Mersey. Runners then come alongside the Albert Dock before hitting a wall of sound at the finish, right under the gaze of the Liver Birds! The MK Half Marathon shares the same tree-lined city boulevards as the marathon, before running through the lush Ouzel Valley, following the beautiful, meandering River Ouzel onto first Walton Lake, one of the richest spots in Milton Keynes to enjoy wildlife, and then onto the very picturesque Caldecotte Lake and superb stadium finish. The course was changed in 2016 to be even flatter; a great opportunity for your fastest ever half! Flat and fast, this course has been described as the fastest marathon course in the UK, perfect for those chasing a PB. Full marathon, half marathon, Hairy Haggis Team Relay, 10k, 5k, or Junior Races, and a stunning backdrop – the Edinburgh Marathon Festival has it all. Scotland’s largest running festival of its kind with over 30,000 runners expected to take part on 26/27 May. Voted the UK’s Best Half Marathon by The Running Awards In 2014 and 2015 - come and find out why…. West London’s only fully closed road half marathon. Suitable for elites, intermediates and beginners, our welcoming race is for everyone. Starts and finishes in Lammas Park, one of West London's most picturesque parks, and takes in the best of Central, North and West Ealing.